This California company is diverting millions of pounds of wasted food away from landfills and onto farms without time-consuming composting methods. You don’t have to dumpster dive to know that supermarkets send a steady stream of uneaten food to landfills. Once there, the waste does more than smell bad. It also contributes to climate change by emitting methane, a greenhouse gas that is around 30 times more potent than carbon dioxide. In fact, landfills are the third largest source of methane emissions in the U.S., according to the Environmental Protection Agency (one reason the USDA recently pledged to reduce food waste 50 percent nationally by 2030). But when a new California state law [PDF] goes into effect this April, large grocery stores in the state will be required to ditch the landfill and compost or recycle their food waste instead. In order for supermarkets to comply with the impending law, they’ll need more places to put the waste—and one Sacramento-based company appears to be well positioned to respond to this problem. California Safe Soil has developed a process that transforms truckloads of supermarket food waste into farm-ready fertilizer it calls Harvest to Harvest, or H2H. Using fertilizer made from food waste also cuts down on the need for synthetic nitrogen fertilizer, he adds, which can reduce the amount of nitrate runoff into local rivers and streams, which often lead to dead zones. The company claims that since its launch in 2012, it has diverted over 2.2 million pounds of food waste from the landfill, preventing the emissions of 3.2 million pounds of greenhouse gases and preventing the need for over 1.1 million pounds of nitrogen fertilizers. How is Morash’s product different from standard compost? 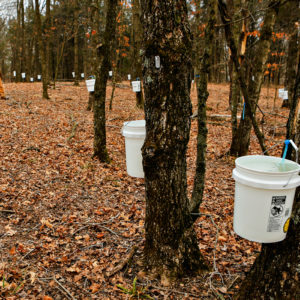 He worked with soil and fertilizer specialist Mark LeJeune to develop a method that fast forwards the composting process (which is fueled by aerobic digestion, or bacteria fed by oxygen that breaks down organic matter). 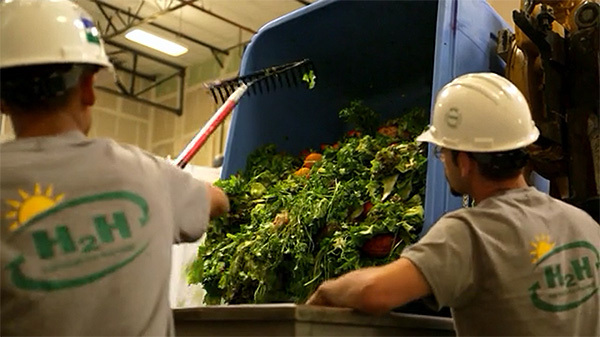 The process turns food waste into liquid fertilizer in three hours. First, the food is ground down into a liquid, then treated with enzymes to break down the protein, fat, and carbohydrates into the amino acids, fatty acids, and simple sugars. Then, it’s pasteurized (that is, heated at high temperatures) to kill any pathogens that might be present. There’s a separate stream for organic and conventional food, as California Safe Soil sells an all-organic version. Both are applied to the crops via drip irrigation. In 2012, Morash and LeJeune opened a pilot plant in Sacramento to develop the technology. The product was commercialized in 2013 and is regulated by the California Department of Food and Agriculture. To show that the product was effective, the company conducted additional experiments with researchers, including one at U.C. Davis and a strawberry expert at U.C. Cooperative Extension. Morash claims that use of his fertilizer on tomatoes has upped the rate of food production by between 10 to 15 percent. California Safe Soil’s target market is mainly large farms that grow crops like strawberries, tomatoes, leafy greens, almonds, and wine grapes. Several of the berry growers that he works with supply for Driscoll’s, Morash says. At the moment, the company processes food waste from 15 stores across five supermarket chains (Grocery Outlet, Nugget, Safeway, SaveMart, and Whole Foods) in Sacramento. Six days a week, the plant processes about 3,750 pounds of food from between seven to eight markets a day (each brings in an average of about 500 pounds daily). The Sacramento facility is operating at capacity, but he hopes to build others in the coming years. 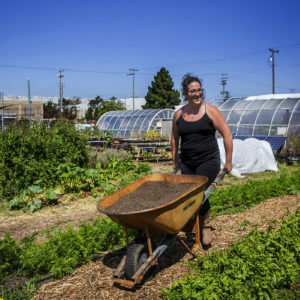 The idea is to locate plants, like the one Sacramento, near grocery distribution centers. This way, after delivering goods to the stores, the centers’ trucks can fill up with food waste for the trip home, Morash says. 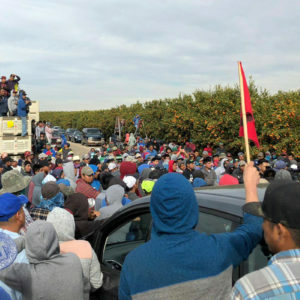 There are additional economic and environmental benefits to locating California Safe Soil plants near distribution centers, he adds. Turning food waste into fertilizer not only saves grocery stores the fees associated with sending it to a landfill, but it also prevents the greenhouse gas emissions and extra transportation costs often needed to deliver it there. Photos, from the top: Employees moving wasted produce into the processing machine; the final liquid fertilizer product; broccoli from a farm trial with the control on the left and the H2H produced product on the right. All courtesy of California Safe Soil. Healthy compost is "alive"- full of important living microorganisms that are responsible for helping the plants take up nutrients in the soil. If you cook (pasteurize) the compost, aren't you killing the living compost? Will this include all GMO produce, too? This is a fascinating article! While I wonder about waste products and energy use, it's exciting to see this kind of innovation to deal with both food waste and the ability of soils to sequester water and carbon. Thanks for sharing! Beth, you’re right! Healthy compost is “alive.” The first thing we have to remember is that our product is a liquid fertilizer made from a 3 hour aerobic enzymatic digestion process without any byproducts produced. We capture food energy that is in the food we process unlike compost that uses food energy to create the heat that it then uses for the composting process. Although we do heat and pasteurize the product, which kills off the pathogens, we do not sterilize it, so the material continues to contain a significant amount of organisms in a dormant state. Once the material is mixed with irrigation water, it provides nutrients to important soil organisms, such as actinomycin, as well as activates the organisms that are in our material. Ginny, thank you for your question! We take all unsold food from grocery stores that cannot be sold or donated to the community. Similar to compost, this includes some GMO food waste as well. Our process breaks materials down into their constituent forms of amino acids, fatty acids and simple sugars with no identifiable residuals remaining, which includes GMOs. On the surface, it sounds like a good idea; however, I'm left with many questions. How much equipment are they using in their process? What the heck IS their process? How costly is it? How much space does it use up? How much energy input is used by the equipment they use? How much water are they using to make this fertilizer slurry? Is there waste left over from the process? I checked the company's website, and they do not answer these questions, either. They claim their method is "proprietary." If, indeed, they are genuinely concerned about the environment, why would they not disclose this information? The lack of transparency is of high concern.